BLACKSBURG, Va., Nov. 30, 2006 – Jim A. Kuypers, assistant professor of communication in the College of Liberal Arts and Human Sciences at Virginia Tech, reveals a disturbing world of media bias in his new book Bush's War: Media Bias and Justifications for War in a Terrorist Age (Rowman & Littlefield Publishers, Inc. 2006). Convincingly and without resorting to partisan politics, Kuypers strongly illustrates in eight chapters “how the press failed America in its coverage on the War on Terror.” In each comparison, Kuypers “detected massive bias on the part of the press.” In fact, Kuypers calls the mainstream news media an “anti-democratic institution” in the conclusion. 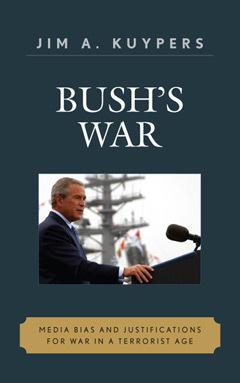 The book is essentially a “comparative framing analysis.” Overall, Kuypers examined themes about 9-11 and the War on Terror that the President used, and compared them to the themes that the press used when reporting on what the president said. “Framing is a process whereby communicators, consciously or unconsciously, act to construct a point of view that encourages the facts of a given situation to be interpreted by others in a particular manner,” notes Kuypers. At the heart of each chapter are these questions: What did President Bush talk about, and how did he want us to think about it? What did the mainstream news media talk about following president Bush’s speeches, and how did they want us to think about it? Kuypers, of Christiansburg, Va., received his Ph.D from Louisiana State University and both his bachelor’s degree and master’s degree from Florida State. He joined Virginia Tech's Department of Communication last year after having taught political communication for tens years at Dartmouth College.